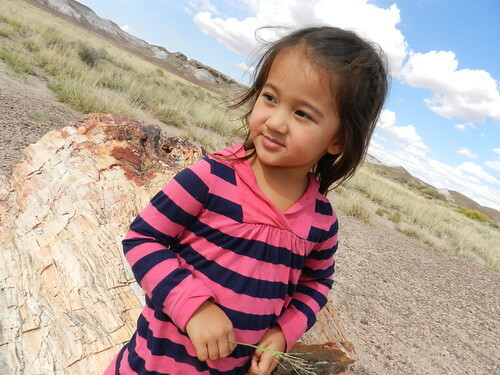 Mali Mish – Day 3: Petrified Forest National Park. We usually try not to have two consecutive transit days but on this trip, we don’t really have a choice. 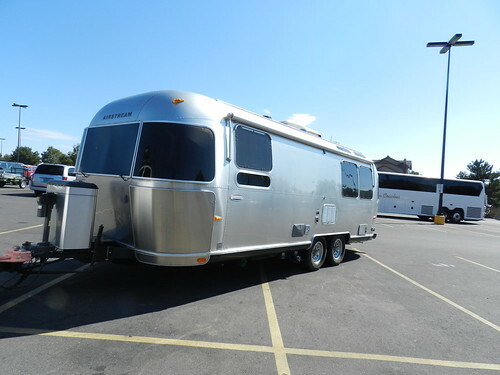 We have be in Albuquerque to make our check in date so the girls will have to deal with waking up in a Walmart parking lot in Flagstaff and pushing on. Walmart has lately been a hit or miss overnight option for us. When we pull into a town that we have never been to late at night, we have not been thrilled about choosing Walmart as our destination. The last thing you want is to arrive at your destination at midnight just to leave for another unknown overnight spot. Lucky for us, this Walmart, right nest to Northern Arizona University, was more than welcoming. There was a small encampment of RVs already settled in for some Zs when we got here last night. 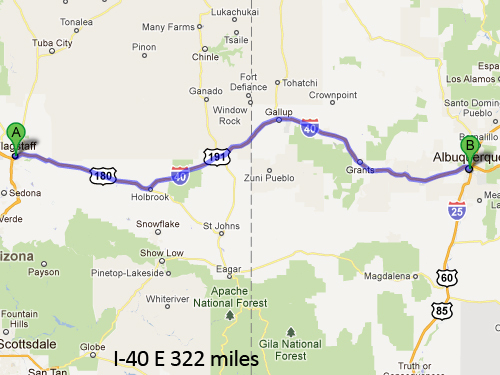 Our goal today is to make it as close to Albuquerque as possible. That means we have another 300+ miles day ahead of us. 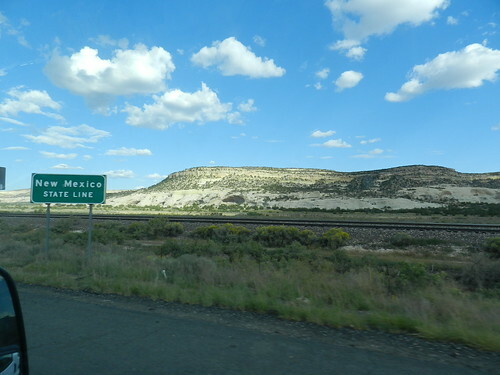 Last year when we came through the area, we missed this stretch of I-40 between Albuquerque and Flagstaff because we took a northern detour to Mesa Verde National Park in Colorado. So this is all new to us. 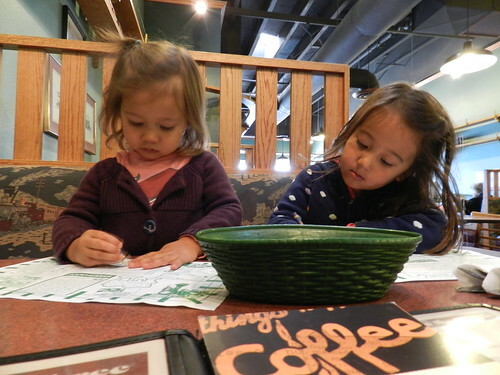 By now the girls are troopers and well into the road tripping groove. 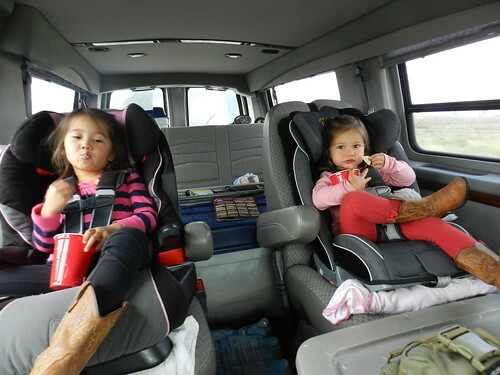 With snacks in hand and a movie playing, they are ready to take on the road. 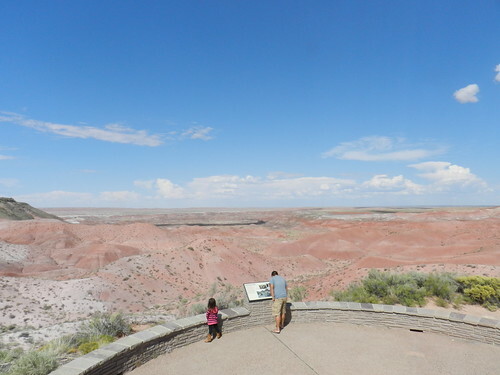 Right near the borders of Arizona and New Mexico on I-40 lies Petrified Forest National Park. It is a remarkable place with some very interesting geography and historical artifacts. We wanted to make a stop since driving 300+ straight miles is a little too hard on the girls who are strapped tightly to their seats. 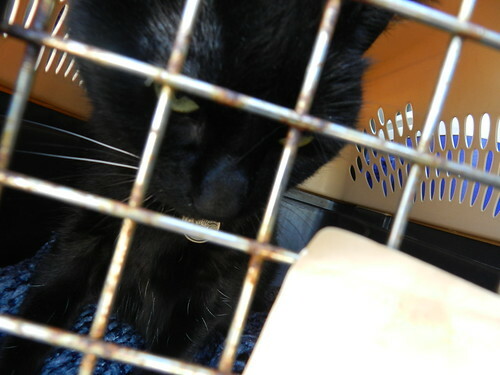 Of course it also lets Yoda get out of her pet carrier for a break to lounge and relax in Mali Mish. 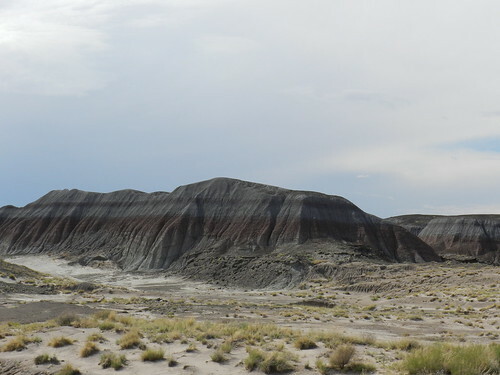 Petrified Forest is part of the famous painted desert that encompass a large portion of the four corners area. Over 200 million years ago during the era of pangaea, these soils use to be near the equator. Much different environment from the high desert climate that it is today. We know that because that is the only explanation for these fossilized tree trunks that exist here today. 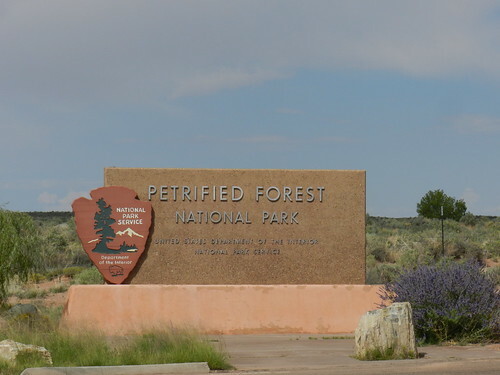 In fact, Petrified Forest National Park has the worlds largest collection of fossilized trees in the world. The theory for their existence is that during the historic times when these trees were alive and part of a rain forest, there was a flood that uprooted many of the trees and washed them downstream of a river. As they settled and waterlogged, they sank to the bottom of the river and were slowly covered by sand and soot. The lack of oxidizing agents preserved the tree trunks and slowly replaced the organic materials with silica and other inorganic compounds that turned them into fossils. Over the years of erosion of the top soil combined with the upward push from the earth’s crust, they eventually resurfaced and ended up where they are today. 250 million years later. What is unfortunate is that in the short time that humans have existed on this planet, many of us have been taking these natural wonders and taking them home instead of letting the world enjoy them. So much so that much of the fossils in the park have been stolen even since the establishment of the national park. The national park system has made it a federal felony to remove anything from the park but that has not completely curb the problem. People are not the only ones changing the landscape of this ancient wonder. This photo shows the visitors how one of the park’s natural wonders changed overnight as it was discovered by a ranger one morning. 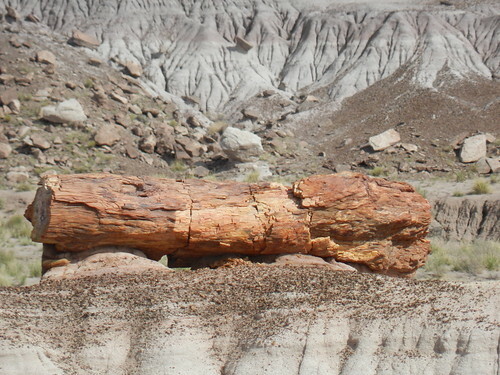 A massive fossilized tree trunk fell from its resting place of hundreds of millions of years. Ava was so touched that she began pondering the meaning of life. I had to remind her that we were here to have fun. Not to philosophize. And no, we did not smuggle this tree in the Mali Mish. But the rangers did ask if we did on our way out of the park. 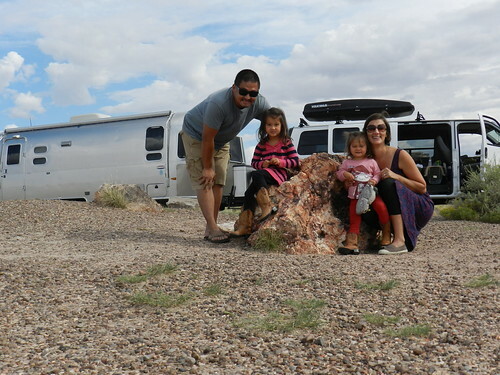 After a pleasant break at the park, we headed eastward towards Albuquerque. Here is Marlene once again mastering her craft of photographing freeway signs on the go. 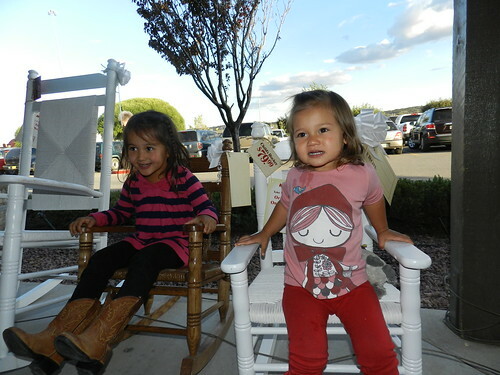 We made it to Gallup, New Mexico for another stop for dinner at our beloved Cracker Barrel before heading for our second consecutive night at a Walmart parking lot in Albuquerque. Tomorrow, Hot Air Balloons! Day 4: Albuquerque Balloon Fiesta and Twilight Twinkle Glow. 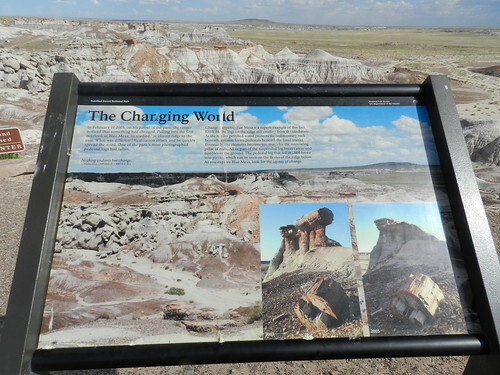 One Response to Day 3: Petrified Forest National Park.